The long-awaited UN Office of the High Commissioner for Human Rights (OHCHR) report that deals largely with wartime abuses in Sri Lanka has finally been made public. It’s a big moment for the island nation and OHCHR has come out with a strong report. This is a detailed, lengthy document that covers a range of disturbing topics, including extrajudicial killings, sexual violence, disappearances, torture, and attacks on civilians. Importantly, the report also includes violations which have occurred since the end of the war (in 2010 and 2011). So, where does Sri Lanka go from here? In the coming days, an informal meeting will be held on Sri Lanka at the UN Human Rights Council (HRC). At that time the possible content of another HRC resolution on Sri Lanka will be discussed. (Originally scheduled to take place on September 17, the event has been pushed back to September 21.) The delay of this meeting may seem insignificant, but it’s actually quite useful. Since the OHCHR report was only made public on September 16, that didn’t give people much time to read the report and consider the recommendations it lays out. …for an accountability mechanism to succeed in Sri Lanka, it will require more than a domestic mechanism. Sri Lanka should draw on the lessons learnt and good practices of other countries that have succeeded with hybrid special courts, integrating international judges, prosecutors, lawyers and investigators, that will be essential to give confidence to all Sri Lankans, in particular the victims, in the independence and impartiality of the process, particularly given the politicisation and highly polarised environment in Sri Lanka. The recommendation is a logical one given Sri Lanka’s history with past domestic accountability mechanisms and the current state of the country’s institutions. Nevertheless, there’s no indication that Sri Lanka’s new government would agree to the establishment of a hybrid accountability mechanism. 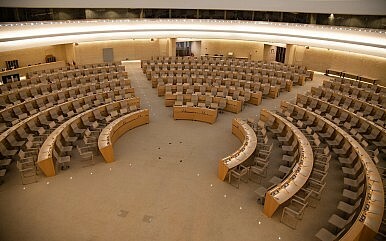 So what’s next for Sri Lanka at the HRC? The U.S. has already made it clear that it will sponsor another HRC resolution on Sri Lanka and that Washington supports Colombo’s domestic accountability process. The U.S. expects to collaborate with the Sri Lankan government on this resolution. Nonetheless, coming up with a consensus resolution on Sri Lanka that satisfies everyone, especially the Tamil community, is going to be virtually impossible. It will be interesting to see which recommendations from the OHCHR report make it into the forthcoming HRC resolution – especially as it relates to institutional reforms and justice. For those pushing for truth and accountability in Sri Lanka, it seems that the best outcome – for now anyway – would be that U.S. diplomats and others convince Colombo of the need for a strong, clear resolution on Sri Lanka at the HRC. A key point here could be, within the framework of Sri Lanka’s domestic mechanism, laying out the details for how members of the international community can be involved in every step of the process. Reaching agreement on the details of the imminent resolution (and the level of international involvement in Colombo’s domestic processes) may be challenging. The HRC’s 30th session will end in two weeks so a lot could happen between now and then. We’ll have to wait and see how things play out.